The CVR(T) Combat Vehicle Reconnaissance (CVR) was designed to carry out three major roles, Fire Support, Anti-tank and Reconnaissance. This new family of armoured vehicles were to be light weight (for aircraft strategic mobility), high performance and maximum fire-power to meet both tactical and strategic needs. It was decided to depart from the then current British practice of using only wheeled reconnaissance vehicles. 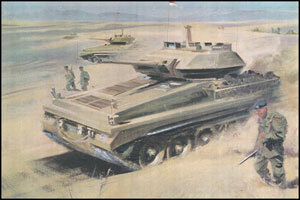 The greatly increased mobility afforded by tracks, combined with advanced techniques, permitted the design of a light, powerful, tracked, reconnaissance weapon system with a fire power hitherto unattainable at the weight desired. The CVR(T) family also proved to be a great success as the Scorpion Light Tank (76mm and 90mm Gun) and is in use with many countries. Indeed CVR(T) is still one of the British Army’s number one frontline vehicles !